Pedal Portugal is an on-going project – which means pages are revised and new pages added (as and when I have time or someone points out that something needs updating or requests new info!). This means that even if you’ve used the site before, new information may have been added since your last visit. Lisbon & Central – new information on public transport and bike lanes in Lisbon. Revised page, published 13th April 2019. Historic Heartland – details of our latest guided tour, first departure from Guarda in spring 2020. New page, published 10th January 2019. Transport – giving advice on planes, trains and ferries has been updated with new links and fresh information. Revised page, published 11th October 2018. Food – a glossary – an A-Z of Portuguese food, from fruit and veg to cooking methods and classic dishes. New page, published 7th May 2017. Cycling clubs & organisations – details of cycling (and cycling-related) organisations and clubs in Portugal. New page, published 13th November. Guided & Self-Guided Touring – extra section on mountain biking with link to site providing map and list of centres with marked routes. Revised page, published 7th November. 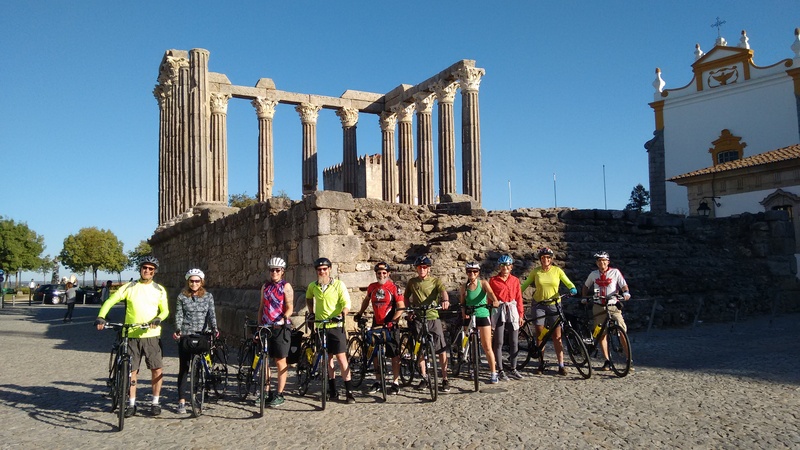 Portugal Cycle Tour Reviews – comments and feedback from riders who have taken part in Pedal Portugal’s guided bike tours. New page, published 11th February. Tavira & The Guadiana – options for up to three days of riding in the south-east corner of the Algarve. New page, published 23rd January 2016. What to Take – ideas for what’s essential when planning a cycle trip. Revised page, published 11th October. Pedal Portugal’s Guided Tours – information on a series of planned guided tours being launched at the end of this year. New page, published 24th April. Bike Shops & Mechanics – updated to include new link to list of dozens of shops across the country. Revised page, published 26th February. Transport – updated to include new details of which trains will carry bikes. Revised page, published 12th February. 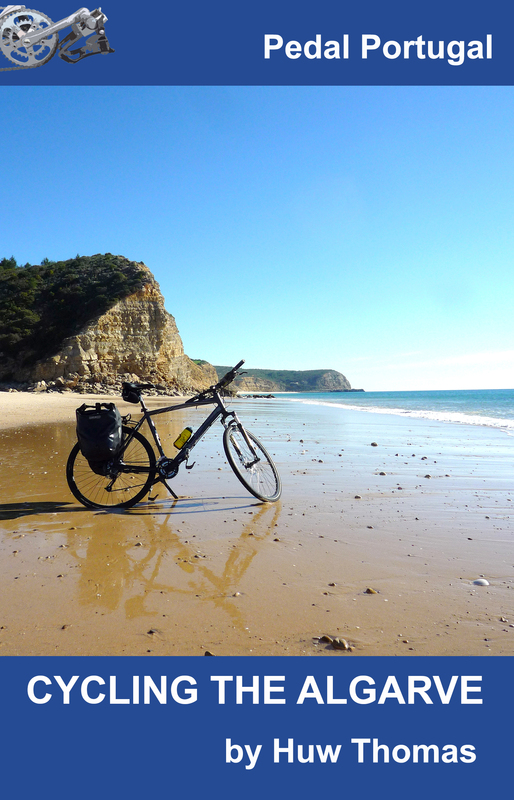 Lagos Back Roads – a great day ride taking a circuit out to some gorgeous and unspoilt beaches. New page, published 27th January. Algarve Adventure – a new touring circuit of the western Algarve’s hills and beaches. New page, published 24th January. Roads & Maps – I’ve updated the section on maps, revising (down) my opinion of Michelin and adding in Portuguese map company ForWays. Revised page, published 17th January 2015. Ecopistas & Ciclovias – information on medium and long-distance off-road cycle paths in Portugal (the few that exist). New page, published 15th December. Mogadouro Explorer – a double loop through the countryside around this attractive but remote northern town. New page, published 14th December. Frontier Crossings – a glorious but reasonably energetic day ride taking you on a circuit over the border into Spain from Montalegre in northern Portugal. New page, published 8th December. Guidebooks – updated following the publication of the first of these, to the Alentejo Circuit. Revised page, published 4th December. Magnificent Montesinho – a fairly tough day ride in the hills of the Montesinho Natural Park in the far north-east. New page, published 16th November. Guidebooks – a new page about the series of Pedal Portugal guidebooks being produced and a sign-up form for anyone interested in publication dates etc. New page, published 14th August. Alentejo Circuit – I’ve changed the main route to include Beja and added a two-day extension going out to the Alentejo coast. Revised edition published 5th July. Home – revised to give a better summary of what’s on the site and where to find it, plus a map showing the touring routes – also now on the Touring Routes page. Revised edition published 28th April. Rooms & Apartments – I’ve been adding more links to this page so that most suggested stops on touring routes and rides have an accommodation entry. Revised edition published 26th April. Border Castles – Alentejo – I’m breaking down the Border Castles Tour into regions. The Alentejo section is finally complete. New page, published 25th April. Campsites – there are now more than 80 Portuguese campsites listed. Revised edition published 24th April. Evora to Lisbon – the final stage across southern Portugal – part of the south-to-north route from the Algarve to Galicia. Revised edition published 7th April. Transport – revised version that includes new information on carrying bikes on planes, using buses and metro systems. Published 6th April. The Alentejo – expanded background on the region and information for cyclists. Revised version published 15th March. Vila Nova to Evora – revised and expanded description of this route through the Alentejo – part of the Algarve to Lisbon route. Revised version published 9th March. Glossary – explanation of Portuguese words for different types of accommodation. New page, published 6th March. Fantasy Castles – a revised and extended version of the ride from the Beiras section previously known as ‘Sortelha Castle’. Published 3rd March. Lagos to Vila Nova – expanded version of the second stage of the Algarve to Lisbon route. Revised version published 28th February. Algarve Hills – another (!) new ride for the Algarve section. One tough day or two easier ones, plus a couple of other options. New page, published 27th February. Aljezur & The Beaches – a new ride and the second for the Algarve. Short but tough! New page, published 24th February. Advertise – new page – and a new step for this site – details of how to advertise on Pedal Portugal. Published 23rd February. Ecopista do Dao – revised version with new, improved map for this fantastic converted railway line. Published 21st February. Northern Portugal – expanded information on cycling in the region. Published 17th February. Transport – revised to include information on buses. Published 17th February. Roads & Maps – expanded to give greater info on road conditions, road numbering and where’s safe to ride. Published 16th February. 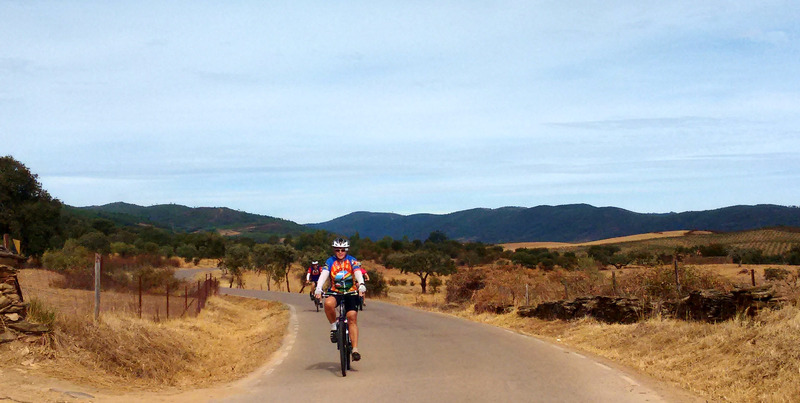 Alenquer Explorer – two rides in the hilly countryside near Alenquer. Published 15th February. Monchique Explorer – the first ride for the Algarve. Either one tough day or two easier ones. Published 14th February. The Algarve – general description for the Day Rides section – ready to add some rides soon. Published 12th February. 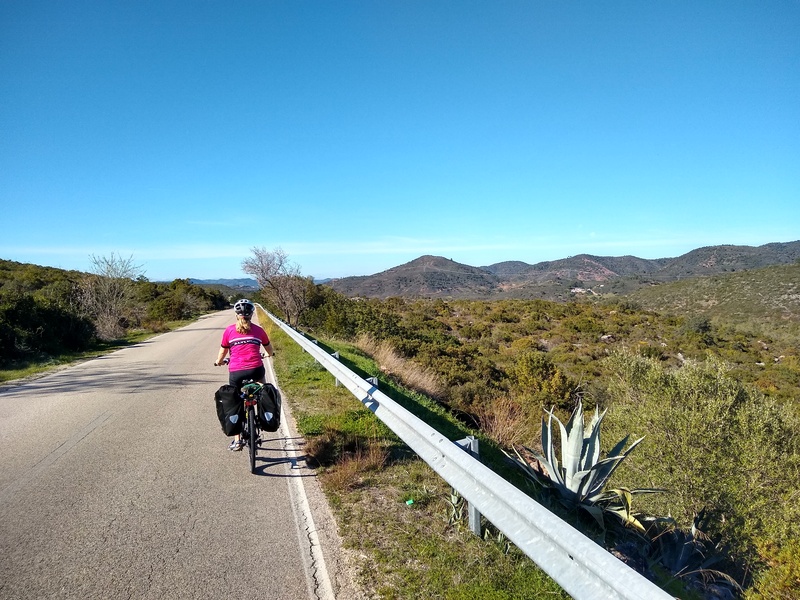 Ayamonte to Lagos – the first stage of our south-north route through Portugal. Published 10th February. 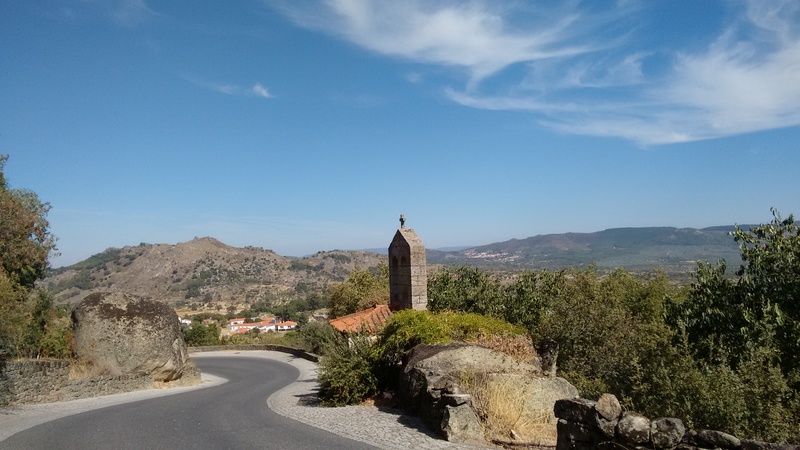 Arouca to Galicia – the fourth and final stage of the route from Lisbon to Spain. Published 7th February. Bike Shops & Mechanics – a new page in the Directory & Links section listing places to buy spares and get repairs done. Still in its infancy – if you’ve got any recommendations to add then please get in touch. Published 5th February. Peniche to Coimbra and Coimbra to Arouca – the next two stages of the south-north tour to get a proper write up. New versions published 2nd February. 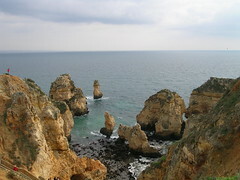 Lisbon to Peniche – one of the first routes added to this site was a south-north tour through Portugal. I only gave a basic outline originally and am now in the process of updating with full details. Published 30th January. Advice Form – use this form for any queries and give me as much information as possible if you want a useful answer. Published 28th January. Money & Costs – how to get hold of your cash and how much you might need. Published 15th January. When To Go & Weather – some advice on the best time to visit, likely weather and where to find forecasts. Published 15th January. Basic Facts – basic information on Portugal’s geography, including population size and density, terrain and climate. Published 14th January. Planning – I’m in the process of revising and extending the planning pages, including grouping them into different sections. This version published 14th January 2013. Bike Hire – details of companies that hire bikes in Portugal. Published 28th November 2013. Maps – information on where/how to buy maps of Portugal. (See also the general Roads & Maps page under Planning.) Published 28th November 2013. Language – a few thoughts on how to communicate with the locals. Published 20th November 2013. Sea to Salamanca – details of a new route, taking you from the Atlantic coast into Spain. Published 14th November 2013. Alentejo to Algarve – details of an inland route from Evora to Loule, near Faro in the Algarve. Published 10th November 2013. Campsites – a growing list of campsites, divided into regions. Listed under town names and with an associated Google map. Published 26th October 2013. Hello. Quite a new member of this site. Fell over it in my efforts to arrange a individual trip in Douro Valley next October. But!! CP wont take bikes, bus companies im not sure and renting up the valley looks like its not possible. Renting in Porto and bring along up Douro would be perfect. does any one have a good proposition? ?